A tasty and delicious Summer Pasta Salad featuring a tangy dijon vinaigrette. Made with zucchini, tomatoes, carrots and kalamata olives. We decided to skip working out on Friday night, and head to the grocery store to buy some much-needed groceries. It has been so hot lately that the thought of doing a major grocery shop has been the last thing that I’ve wanted to do. Turning on the stove or oven for very long is also something that I haven’t wanted to do much of either. 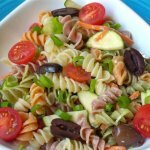 I had seen a Pasta Salad recipe in my America’s Test Kitchen Healthy Family cookbook that sounded really tasty and simple. In my version, I omitted a few things and changed up some of the veggies to suit my taste more. Besides being tasty, one of the best parts of this dish is that it doesn’t require the stove to be on for very long – perfect for the heat wave we have been having lately. 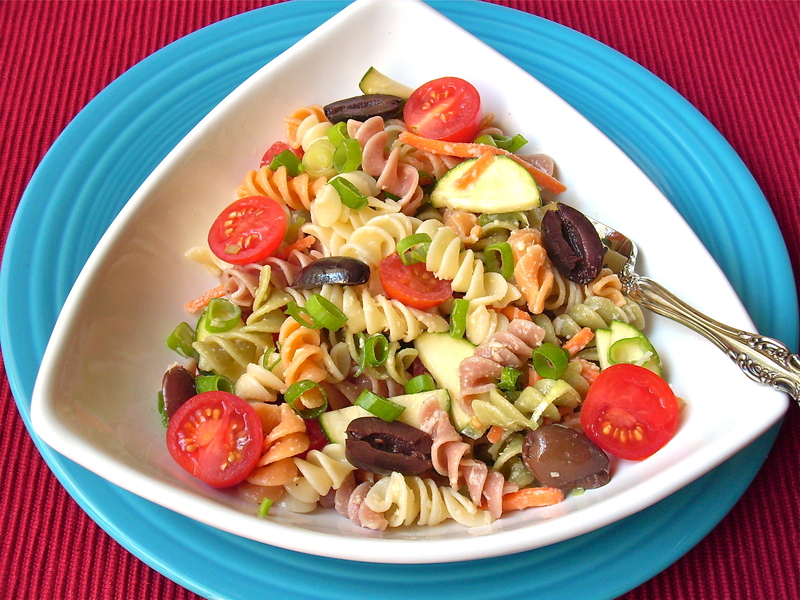 This Summer Pasta Salad should serve about six people as a side dish. If you add some kind of protein to it, then this could serve four people as a main course. 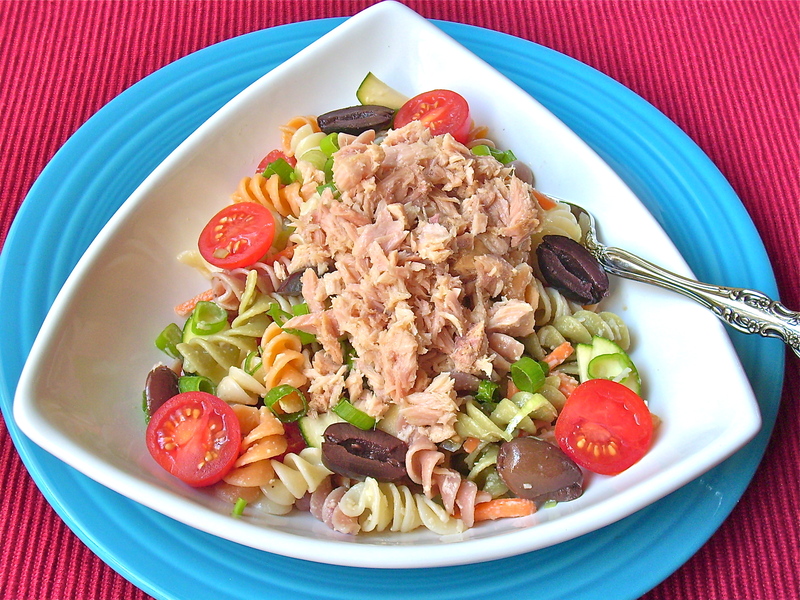 I topped ours off with some canned tuna in olive oil for lunch yesterday. I like to use a colorful pasta like Wacky Mac when I make pasta salads because it just looks prettier to me, but you can use whatever pasta you prefer. 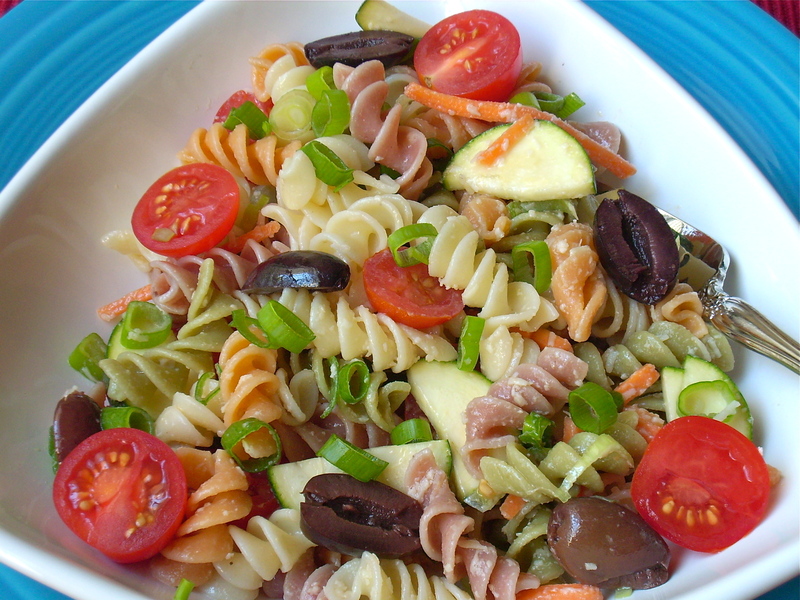 This Summer Pasta Salad comes together very quickly. I chopped the veggies while the pasta was cooking. I did take a little help from the store and buy a bag of pre-chopped matchstick carrots. After draining and rinsing under cold water, I added the pasta to a large bowl with the rest of the ingredients and tossed it together to combine. 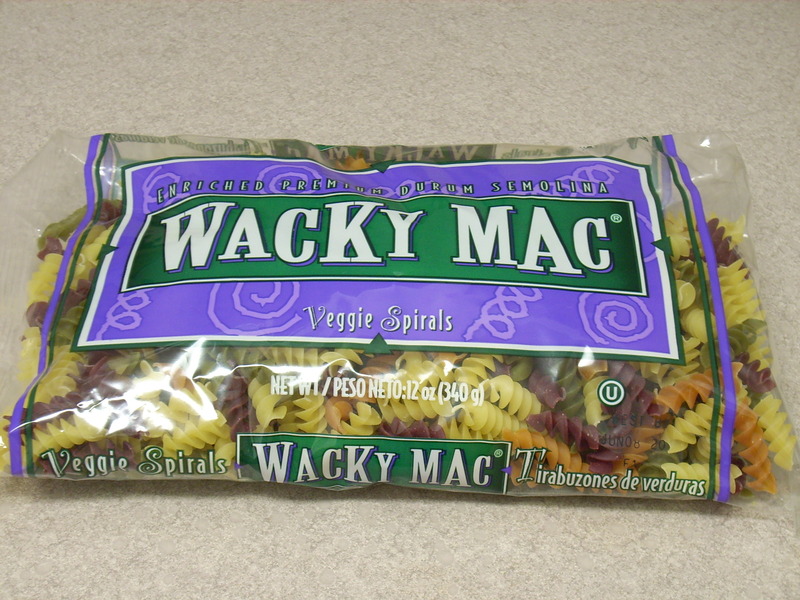 This can be served right away, or refrigerated for up to four hours prior to serving. There are only two of us here at my house, so of course, I knew we would have leftovers. I was afraid that the tomatoes might make the dish a little watery if left to sit in the fridge overnight, so I didn’t add those to the bowl with the rest of the ingredients. After portioning out two servings of salad, I added the tomatoes to our bowls. In a large bowl, place the carrots and zucchini, add 1 tablespoon of red wine vinegar, and toss to coat. Cook pasta according to package directions, until al dente. Drain the pasta, rinse it with cold water to cool it, and drain well again. Add the pasta and the rest of the veggies to the bowl with the carrots and zucchini. In a small bowl, add the remaining 2 tablespoons of vinegar, olive oil, dijon mustard, and garlic. Whisk until combined, pour it over the pasta/veggie mixture, and toss to combine. Add salt to taste and toss again. By Tempie at March 11, 2018 . Previous Post: « A Fresh New Look! As all of your other recipes, I need to try this one also!!! PS: please, if you have a minute drop by to enter my Newest Giveaway!